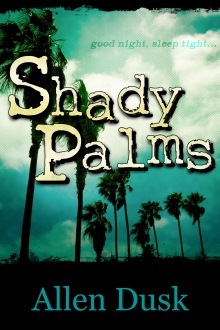 Enter to win an eBook copy of Shady Palms by Allen Dusk! It's amazing what a writer can learn when conducting research for their novel. As for myself, I enjoy starting off with a fantastical idea for a story, and then I pepper it with bits of real life and scientific facts to contribute more realistic flavors. Sometimes these bits of truth can aid you as a writer, other times they can stop you dead in your tracks, making you rethink or even doubt key parts of your plot. I had before never run into this problem until I started working on my novel Shady Palms many, many moons ago. During the summer of 2006 I came up with the idea for a movie called Bedbugs from Hell, which was a modern spoof of old 50's B-Movies. Go ahead, roll your eyes. At first it was a joke tossed around the dialog of an independent film I helped with. Then the thought festered in the back of my brain. What are these bedbugs capable of? Did they really come from Hell? How do they attack? My creative juices started flowing and soon after I drafted a treatment for a motion picture. Not long after this, I had written the 1st draft of the Bedbugs from Hell screenplay. It was loaded with wacky science, cliché characters, horrible dialogue, and silly monster attacks. Then I read over it, suddenly realizing I didn't even know what bedbugs looked like. I knew if I wanted to make my story pack some real punch then I was going to need to submerse myself with insect research. After visiting my local library, browsing a few pest control websites, and getting my hands on an entomology textbook, I soon realized my concepts of bedbugs were all wrong. However, at the same time, the facts I learned about these nasty critters were better than some of the ideas I had been toying with. For example, bedbugs typically only hunt at night, seeking out prey by detecting carbon dioxide in exhaled breath, they communicate with pheromones, and can live for a year without eating. Cool! This was a great start to building monsters that fed on blood while people slept. Then I learned some more: a bedbug's saliva contains anesthetic so prey never feels the bite, and they tend to climb up and drop on victims because they can neither jump nor fly. Even better yet, bedbugs are notoriously hard to kill because they are capable of hiding in places where poisons will never reach them. Now I had some real science to build my story around. Shortly after completing my research and then fleshing out my characters, I decided that Bedbugs from Hell as a movie could never effectively convey all of the emotions, internal dialogue, or interwoven plots I developed for the story. So I decided to turn my concept into a novel and named it Shady Palms after the prominent motel featured in the storyline. The entire time I was writing it, I found myself giving my bedbugs identities and motives, something I never fully realized the beauty of at the time. I often said to myself, "No, the bedbug wouldn't attack this way because that's not in within its natural instincts." I felt compelled to make my bugs act as much as the real things as possible, even though a massive dose of radiation had mutated them to monstrous sizes. The plot evolved much like the bugs themselves; what was once a wacky title was now a gritty horror story grounded in an urban reality. My characters began to take on their own seedy traits, and at times, even had the nerve to dictate how my story would flow. When Shady Palms finally made its way into the hands of critics in the middle of 2012, some commented on how much they enjoyed the parts of the story told from the bedbugs' perspective. These weren't just mindless killers thirsting for blood, but rather a new species searching for food, shelter, and a way to survive. At first I blew off the compliments, not realizing how special they really were. Then I realized that if I had never taken the time to do my research, then I probably would have never told my story the way I did, or give it the serious thought it deserved. Now that I've reflected on the journey which brought Shady Palms to life, I realize that I love the vile beasts which I created more than any other character in the book. Letters from fans echoing the same sentiments have only made that love grow fonder. It seems a shame to only dedicate one book to such miracles on modern fringe science. I suppose one day I'll have to dream up another nightmare for these monsters to infest. Judging by the looks of them, it won't be hard at all. When Special Agent Daniels targets the motel during an investigation, the nefarious owner, Sanjay, must scramble to conceal evidence of his own dark deeds. Just when he believes things can't get any worse, motel guests begin to vanish without a trace. Why don't you book a room for the night and find out? At these bargain rates you'll be lucky if you only find dirty sheets and a few skeletons in the closet. Shady Palms by Allen Dusk is available in trade paperback from Amazon.com and Barnes & Noble. eBooks are available on Kindle, Nook, iTunes, and every other eReader platform. 1. You MUST be a member of the NOR website to enter. 2. Leave a meaningful comment on the post to get entered. Allen Dusk is an award-winning author of dark fiction and poetry. His debut novel Shady Palms is a gritty urban tale splattered with carnage. Allen lives in San Diego, CA with his wife and daughter. Other than writing, his favorite pastimes include photography, geocaching, lusting over old horror movies, and researching supernatural folklore.